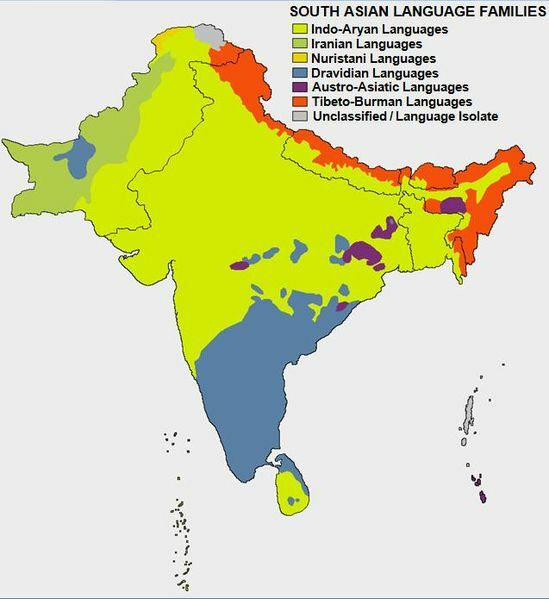 The languages of India are divided into two large groups, the Indo-Aryan languages and the Dravidian languages, with a smaller number of languages belonging to unrelated phyla such as Tibeto-Burman. Linguistic records begin with the appearance of the Brāhmī script from about the 6th century BCE. The end of the Vedic period is marked by the composition of the Upanishads, which form the concluding part of the Vedic corpus in the traditional compilations, dated to roughly 500 BCE. It is around this time that Sanskrit began the transition from a first language to a second language of religion and learning, marking the beginning of the Classical period. The oldest surviving Sanskrit grammar is Pāṇini’s Aṣtādhyāyī (“Eight-Chapter Grammar”) dating to c. the 5th century BCE. It is essentially a prescriptive grammar, i.e., an authority that defines (rather than describes) correct Sanskrit, although it contains descriptive parts, mostly to account for Vedic forms that had already passed out of use in Pāṇini’s time. When the term arose in India, Sanskrit was not thought of as a specific language set apart from other languages (the people of the time regarded languages more as dialects), but rather as a particularly refined or perfected manner of speaking. Knowledge of Sanskrit was a marker of social class and educational attainment and was taught mainly to Brahmins through close analysis of Sanskrit grammarians such as Pāṇini. Scholars from South India often distinguish Vedic Sanskrit and Classical or “Paninian” Sanskrit as separate dialects. However, they are extremely similar in many ways and differ mostly in a few points of phonology, vocabulary, and grammar. Classical Sanskrit can therefore be considered a seamless evolution of the earlier Vedic language. Prakrit (Sanskrit prākṛta प्राकृत (from prakṛti प्रकृति), “original, natural, artless, normal, ordinary, usual”, i.e. “vernacular”, in contrast to samskrta “excellently made”, both adjectives elliptically referring to vak “speech”) refers to the broad family of Indic languages and dialects spoken in ancient India. Some modern scholars include all Middle Indo-Aryan languages under the rubric of “Prakrits”, while others emphasise the independent development of these languages, often separated from the history of Sanskrit by wide divisions of caste, religion, and geography. The Prakrits became literary languages, generally patronized by kings identified with the ksatriya caste. The earliest inscriptions in Prakrit are those of Asoka, emperor of Southern India, and while the various Prakrit languages are associated with different patron dynasties, with different religions and different literary traditions. Pali is the Middle Indo-Aryan language that the Theravada Buddhist scriptures and commentaries are preserved. Pali is believed by the Theravada tradition to be the same language as Magadhi, but modern scholars believe this to be unlikely. Pali shows signs of development from several underlying prakrits as well as some Sanskritisation. The prakrit of the North-western area of India known as Gāndhāra has come to be called Gāndhārī. A few documents written in the Kharoṣṭhi script survive including a version of the Dhammapada. The Prakrits (which includes Pali) were gradually transformed into अपभ्रंश apabhraṃśas which were used until about the 13th century CE. The term apabhraṃśa refers to the dialects of Northern India before the rise of modern Northern Indian languages, and implies a corrupt or non-standard language. A significant amount of apabhraṃśa literature has been found in Jain libraries. While Amir Khusro and Kabir were writing in a language quite similar to modern Hindi-Urdu, many poets, specially in regions that were still ruled by Hindu kings, continued to write in Apabhraṃśa. Apabhraṃśa authors include Sarahapad of Kamarupa, Devasena of Dhar (9th century CE), Pushpadanta of Manikhet (9th century CE), Dhanapal, Muni Ramsimha, Hemachandra of Patan, Raighu of Gwalior (15th century CE). An early example of the use of Apabhraṃśa is in Vikramūrvashīiya of Kalidasa, when Pururava asks the animals in the forest about his beloved who had disappeared. The Dravidian family of languages includes approximately 73 languages that are mainly spoken in southern India and northeastern Sri Lanka, as well as certain areas in Pakistan, Nepal, Bangladesh, and eastern and central India, as well as in parts of Afghanistan and Iran, and overseas in other countries such as the United Kingdom, United States, Canada, Malaysia and Singapore. Many linguists, however, tend to favour the theory that speakers of Dravidian languages spread southwards and eastwards through the Indian subcontinent, based on the fact that the southern Dravidian languages show some signs of contact with linguistic groups which the northern Dravidian languages do not. Proto-Dravidian is thought to have differentiated into Proto-North Dravidian, Proto-Central Dravidian and Proto-South Dravidian around 1500 BCE, although some linguists have argued that the degree of differentiation between the sub-families points to an earlier split. It was not until 1856 that Robert Caldwell published his Comparative grammar of the Dravidian or South-Indian family of languages, which considerably expanded the Dravidian umbrella and established it as one of the major language groups of the world. Caldwell coined the term “Dravidian” from the Sanskrit drāvida, related to the word ‘Tamil’ or ‘Tamilan’, which is seen in such forms as into ‘Dramila’, ‘Drami˜a’, ‘Dramida’ and ‘Dravida’ which was used in a 7th-century text to refer to the languages of the southern India. The publication of the Dravidian Etymological Dictionary by T. Burrow and M. B. Emeneau was a landmark event in Dravidian linguistics. As a Dravidian language, Tamil descends from Proto-Dravidian. Linguistic reconstruction suggests that Proto-Dravidian was spoken around the 3rd millennium BCE, possibly in the region around the lower Godavari river basin in peninsular India. The material evidence suggests that the speakers of Proto-Dravidian were the culture associated with the Neolithic complexes of South India. The next phase in the reconstructed proto-history of Tamil is Proto-South Dravidian. The linguistic evidence suggests that Proto-South Dravidian was spoken around the middle of the 2nd millennium BCE, and that proto-Tamil emerged around the 3rd century BCE. The earliest epigraphic attestations of Tamil are generally taken to have been written shortly thereafter. Among Indian languages, Tamil has the most ancient non-Sanskritised Indian literature. The exact period when the name “Tamil” came to be applied to the language is unclear, as is the precise etymology of the name. The earliest attested use of the name is in a text that is perhaps as early as the 1st century BCE. Old Tamil preserved many features of Proto-Dravidian, including the inventory of consonants, the syllable structure, and various grammatical features. Amongst these was the absence of a distinct present tense – like Proto-Dravidian, Old Tamil only had two tenses, the past and the “non-past”. Old Tamil verbs also had a distinct negative conjugation (e.g. kāṇēṉ (காணேன்) “I do not see”, kāṇōm (காணோம்) “we do not see”) Nouns could take pronominal suffixes like verbs to express ideas: e.g. peṇṭirēm (பெண்டிரேம்) “we are women” formed from peṇṭir (பெண்டிர்) “women” + -ēm (ஏம்) and the first person plural marker. The evolution of Old Tamil into Middle Tamil, which is generally taken to have been completed by the 8th century, was characterised by a number of phonological and grammatical changes. In phonological terms, the most important shifts were the virtual disappearance of the aytam (ஃ), an old phoneme, the coalescence of the alveolar and dental nasals, and the transformation of the alveolar plosive into a rhotic. In grammar, the most important change was the emergence of the present tense. The present tense evolved out of the verb kil (கில்), meaning “to be possible” or “to befall”. In Old Tamil, this verb was used as an aspect marker to indicate that an action was micro-durative, non-sustained or non-lasting, usually in combination with a time marker such as ṉ (ன்). In Middle Tamil, this usage evolved into a present tense marker – kiṉṟ (கின்ற) – which combined the old aspect and time markers. Tamil literature (Tamil: தமிழ் இலக்கியம்) is the literature in the Tamil language. Tamil literature has a rich and long literary tradition spanning more than two thousand years. The oldest extant works show signs of maturity indicating an even longer period of evolution. 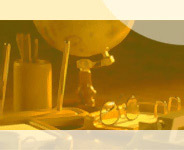 Contributors to the Tamil literature are mainly from Tamil people from Tamil Nadu, Sri Lankan Tamils from Sri Lanka, and from Tamil diaspora. Also, there have been notable contributions from European authors. The history of Tamil literature follows the history of Tamil Nadu, closely following the social and political trends of various periods. The secular nature of the early Sangam poetry gave way to works of religious and didactic nature during the Middle Ages. Jain and Buddhist authors during the medieval period and Muslim and European authors later, contributed to the growth of Tamil literature. A revival of Tamil literature took place from the late 19th century when works of religious and philosophical nature were written in a style that made it easier for the common people to enjoy. Nationalist poets began to utilize the power of poetry in influencing the masses. With growth of literacy, Tamil prose began to blossom and mature. Short stories and novels began to appear. The popularity of Tamil Cinema has also provided opportunities for modern Tamil poets to emerge. Telugu is hypothesised to have originated from a reconstructed Proto-Dravidian language. It is a highly Sanskritised language; as Telugu scholar C.P Brown states in page 266 of his book A Grammar of the Telugu language: “if we ever make any real progress in the language the student will require the aid of the Sanskrit Dictionary”. Inscriptions containing alleged Telugu words dated back to 400 BCE were discovered in Bhattiprolu in District of Guntur. 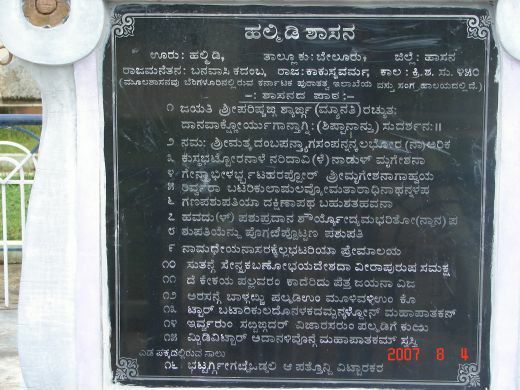 English translation of one inscription as reads: “Gift of the slab by venerable Midikilayakha”. Around the same time, the Chalukya kings of Telangana also began using Telugu for inscriptions. Telugu was more influenced by Sanskrit than Prakrit during this period, which corresponded to the advent of Telugu literature. This literature was initially found in inscriptions and poetry in the courts of the rulers, and later in written works such as Nannayya’s Mahabharatam (1022 CE). During the time of Nannayya, the literary language diverged from the popular language. This was also a period of phonetic changes in the spoken language. Telugu underwent a great deal of change (as did other Indian languages), progressing from medieval to modern. The language of the Telangana region started to split into a distinct dialect due to Muslim influence: Sultanate rule under the Tughlaq dynasty had been established earlier in the northern Deccan during the 14th century CE. South of the Krishna River (in the Rayalaseema region), however, the Vijayanagara empire gained dominance from 1336 CE till the late 17th century, reaching its peak during the rule of Krishnadevaraya in the 16th century, when Telugu literature experienced what is considered to be its golden age. Padakavithapithamaha, Annamayya, contributed many atcha (pristine) Telugu Padaalu to this great language. In the latter half of the 17th century, Muslim rule extended further south, culminating in the establishment of the princely state of Hyderabad by the Asaf Jah dynasty in 1724 CE. This heralded an era of Persian/Arabic influence on the Telugu language, especially on that spoken by the inhabitabts of Hyderabad. The effect is also felt in the prose of the early 19th century, as in the Kaifiyats. Though Carnatic music (Karnataka sangitha) has a profound cultural influence on all of the South Indian states and their respective languages, most songs (Kirtanas) are in Kannada and Telugu. Purandaradasa is known as the father of Carnatic music. He is said to have composed at least a quarter million songs. The region to the east of Tamil Nadu stretching from Tanjore in the south to Andhra Pradesh in the north was known as the Carnatic region during 17th and 18th centuries. The Carnatic war in which Robert Clive annexed Trichirapali is relevant. The music that prevailed in this region during the 18th century onwards was known as Carnatic music. This is because the existing tradition is to a great extent an outgrowth of the musical life of the principality of Thanjavur in the Kaveri delta. Thanjavur was the heart of the Chola dynasty (from the 9th century to the 13th), but in the second quarter of the 16th century a Telugu Nayak viceroy (Raghunatha Nayaka) was appointed by the emperor of Vijayanagara, thus establishing a court whose language was Telugu. The Nayaks acted as governors of what is present day Tamil Nadu with their headquarters at Thanjavur (1530–1674 CE) and Madurai(1530-1781 CE). After the collapse of Vijayanagar, Thanjavur and Madurai Nayaks became independent and ruled for the next 150 years until they were replaced by Marathas. This was the period when several Telugu families migrated from Andhra and settled down in Thanjavur and Madurai. Most great composers of Carnatic music belonged to these families. Telugu, a language ending with vowels, giving it a mellifluous quality, was considered suitable for musical expression. Of the trinity of Carnatic music composers, Tyagaraja’s and Syama Sastri’s compositions were largely in Telugu, while Muttuswami Dikshitar is noted for his Sanskrit texts. Tyagaraja is remembered both for his devotion and the bhava of his krithi, a song form consisting of pallavi, (the first section of a song) anupallavi (a rhyming section that follows the pallavi) and charanam (a sung stanza which serves as a refrain for several passages in the composition). The texts of his kritis are almost all in Sanskrit, in Telugu (the contemporary language of the court). This use of a living language, as opposed to Sanskrit, the language of ritual, is in keeping with the bhakti ideal of the immediacy of devotion. Sri Syama Sastri, the oldest of the trinity, was taught Telugu and Sanskrit by his father, who was the pujari (Hindu priest) at the Meenakshi temple in Madurai. Syama Sastri’s texts were largely composed in Telugu, widening their popular appeal. Some of his most famous compositions include the nine krithis, Navaratnamaalikā, in praise of the goddess Meenakshi at Madurai, and his eighteen krithi in praise of Kamakshi. As well as composing krithi, he is credited with turning the svarajati, originally used for dance, into a purely musical form. Kannada is one of the oldest south Indian languages with an antiquity of at least 2000 years. The spoken language is said to have separated from its proto-language source earlier than Tamil and about the same time as Tulu. However, archaeological evidence would indicate a written tradition for this language of around 1500–1600 years. The initial development of the Kannada language is similar to that of other south Indian languages and independent of Sanskrit. By the time Halmidi shasana (stone inscription) Kannada had become an official language. It is said that the halekannnada later developed and deviated into 2 currently coexisting languages Kannada and Telugu. During this era language underwent a lot of changes as seen from the literary works of great poets of the era viz Pampa, Ranna, Ponna. Vijayanagar Empire which is called the Golden era in the history of medieval India saw a lot of development in all literary form of both Kannada and Telugu. During the ruling of the King Krishnadevaraya many wonderful works. Poet Kumaravyasa wrote Mahabharata in Kannada in a unique style called “shatpadi” (six lines is a stanza of the poem).. This era also saw the origin of Dasa sahitya, the Carnatic music. Purandaradasa and Kanakadasa wrote several songs praising lord Krishna. This gave a new dimension to Kannada literature. The first written record in the Kannada language is traced to Emperor Ashoka’s Brahmagiri edict dated 200 AD. The first example of a full-length Kannada language stone inscription (shilashaasana) containing Brahmi characters with characteristics attributed to those of protokannada in Hale Kannada (Old Kannada) script can be found in the Halmidi inscription, dated c. 450, indicating that Kannada had become an administrative language by this time. Over 30,000 inscriptions written in the Kannada language have been discovered so far. The Chikkamagaluru inscription of 500 CE is another example. Prior to the Halmidi inscription, there is an abundance of inscriptions containing Kannada words, phrases and sentences, proving its antiquity. Badami cliff shilashaasana of Pulakesi I is an example of a Sanskrit inscription in Hale Kannada script. 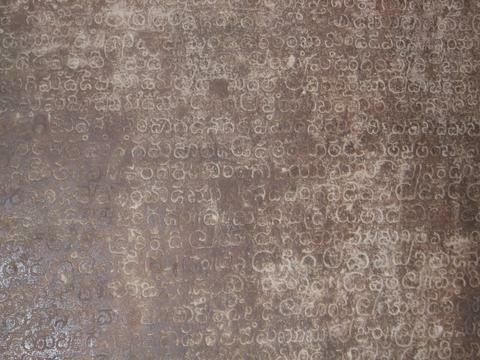 Examples of early Sanskrit-Kannada bilingual copper plate inscriptions (tamarashaasana) are the Tumbula inscriptions of the Western Ganga Dynasty dated 444 A.D. The earliest full-length Kannada tamarashaasana in Old Kannada script (early 8th century) belongs to Alupa King Aluvarasa II from Belmannu, South Kanara district and displays the double crested fish, his royal emblem. The oldest well-preserved palm leaf manuscript is in Old Kannada and is that of Dhavala, dated to around the 9th century, preserved in the Jain Bhandar, Mudbidri, Dakshina Kannada district. The manuscript contains 1478 leaves written in ink. The Austroasiatic family of languages includes the Santal and Munda languages of eastern India, Nepal, and Bangladesh, along with the Mon–Khmer languages spoken by the Khasi and Nicobarese in India and in Burma, Thailand, Laos, Cambodia, Vietnam, and southern China. 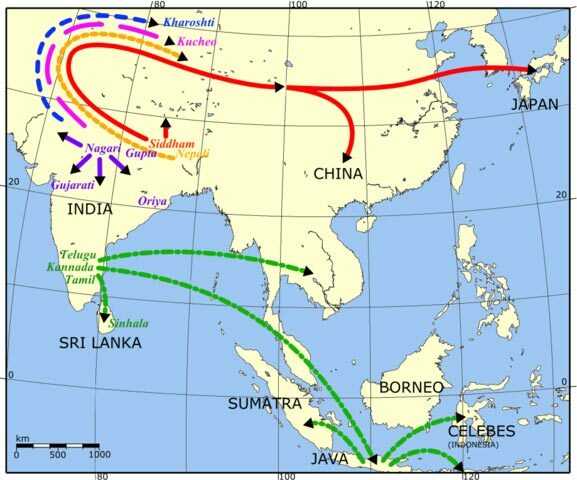 The Austroasiatic languages are thought to have been spoken throughout the Indian subcontinent by hunter-gatherers who were later assimilated first by the agriculturalist Dravidian settlers and later by the Indo-Aryan peoples arriving from northwestern India. The Austroasiatic family is thought to be the first to be spoken in ancient India. Some believe the family to be a part of an Austric superstock of languages, along with the Austronesian language family. According to Joseph Greenberg, the Andamanese languages of the Andaman Islands and the Nihali language of central India are thought to be Indo-Pacific languages related to the Papuan languages of New Guinea, Timor, Halmahera, New Britain,etc. Nihali has been shown to be related to Kusunda of central Nepal. However, the proposed Indo-Pacific relationship has not been established through the comparative method, and has been dismissed as speculation by most comparative linguists. Nihali and Kusunda are spoken by hunting people living in forests. Both languages have accepted many loan words from other languages, Nihali having loans from Munda (Korku), Dravidian and Indic languages. The Indus script is the short strings of symbols associated with the Harappan civilization of ancient India (most of the Indus sites are distributed in present-day Pakistan and northwest India) used between 2600–1900 BCE, which evolved from an early Indus script attested from around 3500–3300 BCE. They are most commonly associated with flat, rectangular stone tablets called seals, but they are also found on at least a dozen other materials. The first publication of a Harappan seal dates to 1875, in the form of a drawing by Alexander Cunningham. Since then, well over 4000 symbol-bearing objects have been discovered, some as far afield as Mesopotamia. After 1500 BCE, use of the symbols ends, together with the final stage of Harappan civilization. There are over 400 different signs, but many are thought to be slight modifications or combinations of perhaps 200 ‘basic’ signs. The symbols remain undeciphered (in spite of numerous attempts that did not find favour with the academic community), and most scholars tend to classify them as proto-writing rather than writing proper. The best known inscriptions in Brāhmī are the rock-cut edicts of Ashoka, dating to the 3rd century BCE. These were long considered the earliest examples of Brāhmī writing, but recent archaeological evidence in Sri Lanka and Tamil Nadu suggest the dates for the earliest use of Brāhmī to be around the 6th century BCE, dated using radiocarbon and thermoluminescence dating methods. 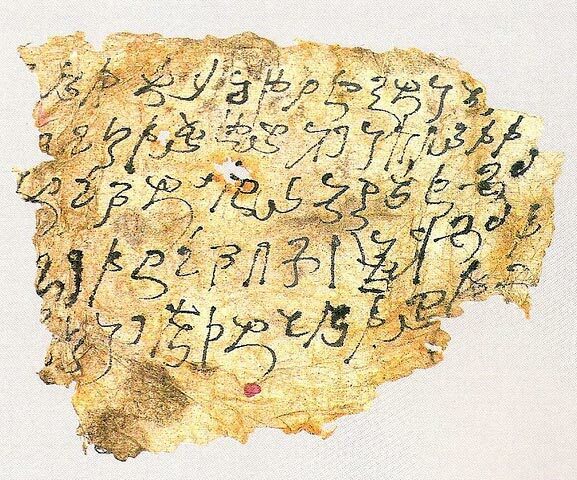 This script is ancestral to most of the scripts of South Asia, Southeast Asia, Tibet, Mongolia, Manchuria, and perhaps even Korean Hangul. The Brāhmī numeral system is the ancestor of the Hindu-Arabic numerals, which are now used worldwide. Brāhmī is generally believed to be derived from a Semitic script such as the Imperial Aramaic alphabet, as was clearly the case for the contemporary Kharosthi alphabet that arose in a part of northwest Indian under the control of the Achaemenid Empire. Rhys Davids suggests that writing may have been introduced to India from the Middle East by traders. Another possibility is with the Achaemenid conquest in the late 6th century BCE. It was often assumed that it was a planned invention under Ashoka as a prerequisite for the his edicts. Compare the much better documented parallel of the Hangul script. Older examples of the Brahmi script appear to be on fragments of pottery from the trading town of Anuradhapura in Sri Lanka, which have been dated to the early 5th century BCE. Even earlier evidence of the Brahmi script has been discovered on pieces of pottery in Adichanallur, Tamil Nadu. Radio-carbon dating has established that they belonged to the 6th century BCE. Paper strip with writing in Kharoṣṭhī script. 2nd to 5th century CE, Yingpan, Eastern Tarim Basin, Xinjiang Museum. The study of the Kharoṣṭhī script was recently invigorated by the discovery of the Gandharan Buddhist Texts, a set of birch-bark manuscripts written in Kharoṣṭhī, discovered near the Afghan city of Haḍḍā (compare Panjabi HAḌḌ ਹੱਡ s. m. “A bone, especially a big bone of dead cattle” referring to the famous mortuary grounds if the area): just west of the Khyber Pass. The manuscripts were donated to the British Library in 1994. The entire set of manuscripts are dated to the 1st century CE making them the oldest Buddhist manuscripts in existence. 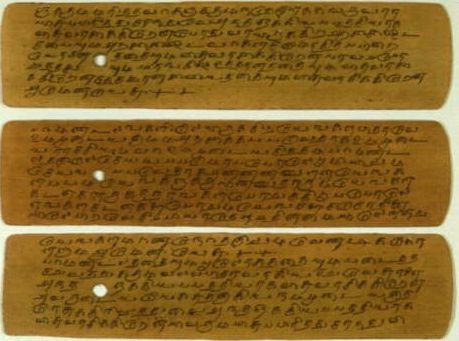 A replica of Siddhaṃ manuscript on palm-leaf in 609 CE. Siddhaṃ is an abugida or alphasyllabary rather than an alphabet because each character indicates a syllable. If no other mark occurs then the short ‘a’ is assumed. Diacritic marks indicate the other vowels, the pure nasal (anusvara), and the aspirated vowel (visarga). A special mark (virama), can be used to indicate that the letter stands alone with no vowel which sometimes happens at the end of Sanskrit words. 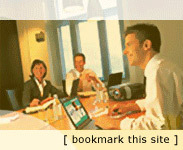 See links below for examples. The writing of mantras and copying of Sutras using the Siddhaṃ script is still practiced in Shingon Buddhism in Japan but has died out in other places. It was Kūkai who introduced the Siddham script to Japan when he returned from China in 806, where he studied Sanskrit with Nalanda trained monks including one known as Prajñā. Sutras that were taken to China from India were written in a variety of scripts, but Siddham was one of the most important. By the time Kūkai learned this script the trading and pilgrimage routes over land to India, part of the Silk Road, were closed by the expanding Islamic empire of the Abbasids. Then in the middle of the 9th century there were a series of purges of “foreign religions” in China. This meant that Japan was cut off from the sources of Siddham texts. In time other scripts, particularly Devanagari replaced it in India, and so Japan was left as the only place where Siddham was preserved, although it was, and is only used for writing mantras and copying sutras. Siddhaṃ was influential in the development of the Kana writing system, which is also associated with Kūkai – while the Kana shapes derive from Chinese characters, the princlple of a syllable-based script and their systematic ordering was taken over from Siddham.